Feel festive on these three trails. The picnic table is coated with a thin, fluffy layer of snow that stirs as a wind gust sweeps in from the open ledge. 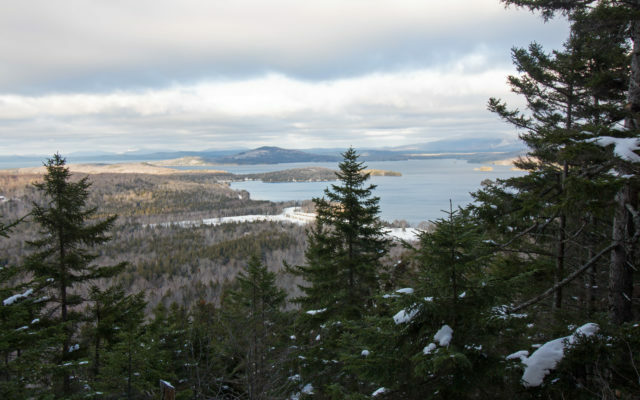 It’s a pretty sight, the snow swirling and sparkling in the sun, but the hikers don’t notice — they’re busy taking in the stunning view of Moosehead Lake, silvery blue under a cloudy December sky. The first of many outlooks on Little Moose Mountain, the picnicking spot is the perfect place for a water break. Stepping back from the ledge to the shelter of a dense evergreen forest, the two hikers unfold their trail map and hold it between them, tracing the long line that represents the Little Moose Mountain Trail. It travels along the mountain’s long ridge, east to west, visiting a number of outlooks and peaks. They’ll turn around at a highpoint of the ridge around 2,000 feet above sea level, they decide, and if they keep up a good pace, they’ll be back to downtown Greenville in plenty of time to grab hot chocolates at Northwood Outfitters and do some holiday shopping. Full of balsam fir trees, the forest smells of Christmas. The fresh snow is crisscrossed with the tracks of snowshoe hares and squirrels. After tucking away their map, the hikers continue on their way, their ice cleats biting into the fresh snow as they follow the blue blazes up the mountain. Rising just over 2,000 feet above sea level near the southwest shore of Moosehead Lake, Little Moose Mountain forms a long ridge that towers above scenic ponds, then arcs slightly north as if reaching toward its sister mountain, Big Moose. This mountain is easily accessible in the winter, and the well-maintained and marked trail that explores its ridge is great for hiking and snowshoeing both. In addition, this mountain is covered with mostly evergreen trees, which keep their deep green needles year round, sheltering hikers from the elements. The mountain is located in the state-owned 1,500-acre Little Moose Public Reserved Land Unit, and the trails that run over the mountain also connect with trails that lead to nearby ponds and backcountry campsites. Altogether, the trail network totals about 9 miles. Because Little Moose Mountain has a long ridge with multiple peaks and viewpoints, hikers have many options for turn-around points. For example, hiking 4 miles, up the ridge of Little Moose Mountain and back to the trailhead, you’ll come to 10 viewpoints that offer different perspectives of the Moosehead Region. Access is free, and dogs are permitted. For information, visit maine.gov/littlemoose or call 207-778-8231. Directions: Check to see if new parking lot is open. The easternmost trailhead, which is accessible by vehicle in the winter, is used to hike along the mountain’s ridge starting from the northeast. To get there from the major intersection of Route 15 and Lily Bay Road in downtown Greenville, turn west on Route 15/6 (Pritham Avenue) and drive 2.9 miles, around the west side of Moosehead Lake, then turn left into the parking lot of Moose Mountain Inn. The trailhead kiosk and trailhead parking is located on the east side of the inn’s parking lot. Topping off at 1,020 feet above sea level, Great Pond Mountain is the tallest and most prominent mountain in the 4,300-acre Great Pond Mountain Wildlands in Orland. With open ledges near its summit that offer great views of the region, this mountain features the most popular hike in the Wildlands, which is home to a vast network of hiking and multi-use trails. The trail for this mountain is open year round and is a popular snowshoeing destination. Starting from the parking lot, which is consistently plowed in the winter, the hike to the top of the mountain and back down is about 2.5 miles and includes gradual climbing over bare bedrock, stone staircases, uneven terrain, exposed tree roots and a few soggy sections of trail (which in the winter will be frozen solid). While the majority of the trail is well marked and easy to follow, the trail can be difficult to follow at the top of the mountain, where it forms a loop and travels over exposed bedrock. Hiking with a GPS would be advisable so you can confidently explore this area of the mountain, enjoy spectacular views, then find the trail once more to descend the mountain. Access is free, and dogs are permitted on leash. For information, call the GPMCT office at 207-469-7190 or e-mail info@greatpondtrust.org. Directions: From Route 1-Route 3 (Acadia Highway) in east Orland, turn onto Hatchery Road, which is a little more than a mile west of the intersection of Route 1-Route 3 and Route 15. Drive 1.4 miles and you’ll pass by the Craig Brook National Fish Hatchery on your left, then the road takes a bend to the right and becomes Nature Trails Road (also known as Don Fish Road). Drive 0.5 mile and you’ll be at the Dead River Gate. Park here in the winter when the rest of the road is not plowed. However, if the road is open, continue past Dead River Gate for just over 0.5 mile and you’ll reach the Great Pond Mountain Trailhead and parking area. Built by Colonel John Black in the 1820s, Woodlawn was home to three generations of the family before a descendent willed the estate to the Hancock County Trustees of Public Reservations in 1928. Now the historic property is home to a museum that hosts a variety of public programs and workshops, and the 180 acres surrounding the home features a network of trails that total 2.5 miles and form three loops. Initially, Woodlawn’s trails were built in the 1800s as exercise tracks for the Black’s family horses. Later, automobiles were driven on them, but today, you’ll see no evidence of that. The relatively wide trails, off limits to vehicles, are used by the public for walking, running, cross-country skiing and snowshoeing. And benches along the trails provide comfortable places to rest and observe wildlife. While the Woodlawn Museum closes on Oct. 31, it reopens in December for holiday tours, high teas and traditional Christmas feasts. Call ahead and plan your visit, combining a refreshing walk on the trails with one of these festive museum events. Access to the trails are free, and dogs are permitted on leash no longer than 8 feet. For information, visit woodlawnmuseum.org or call 207-667-8671. Directions: Woodlawn is located at 19 Black House Drive in Ellsworth. To get there, start at the intersection of Route 1 and Route 172 (also known as Surry Road) in Ellsworth. Drive approximately 0.25 mile on Surry Road and turn right onto Black House Drive, which is marked with a big white sign that reads “Woodlawn Museum, Garden & Park.” Follow signs to the large parking area at the end of the drive.